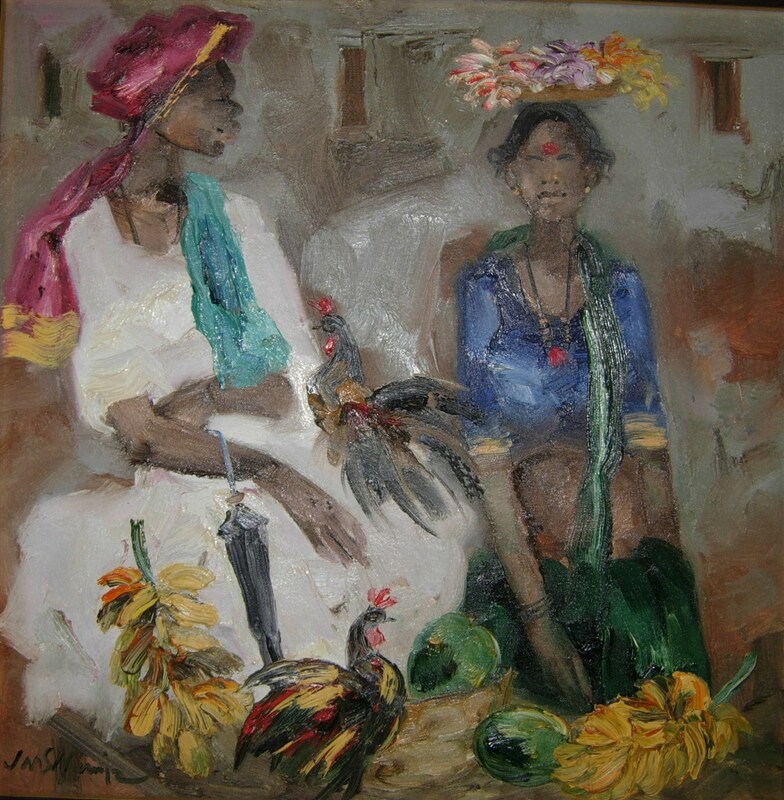 The simple, rustic folk of the Deccan Plateau in South India, with strong Dravidian (an ancient race in South India) features, are the subjects of J.M.S. 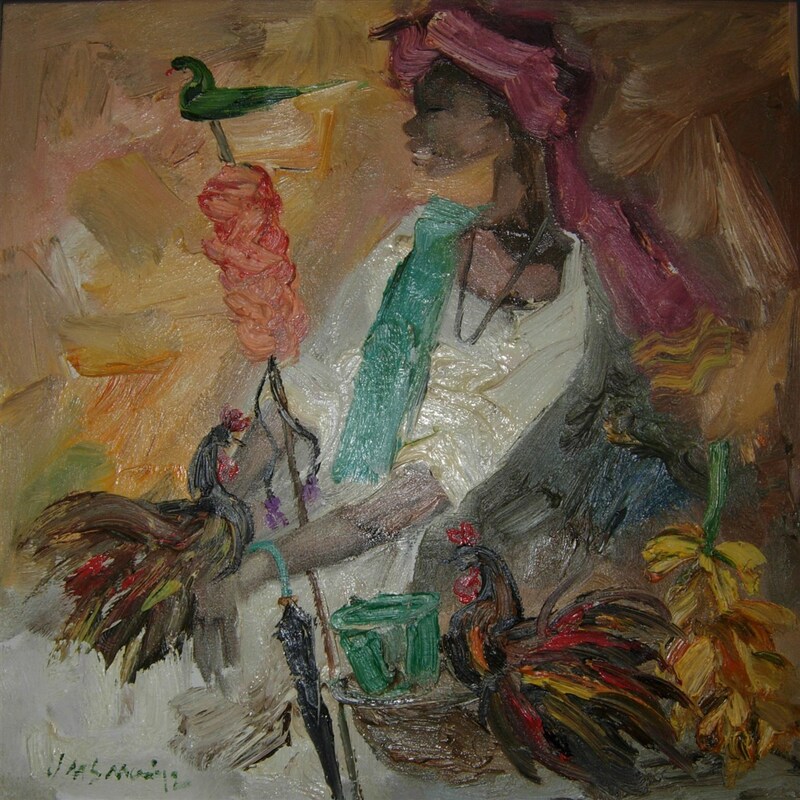 Mani's paintings. 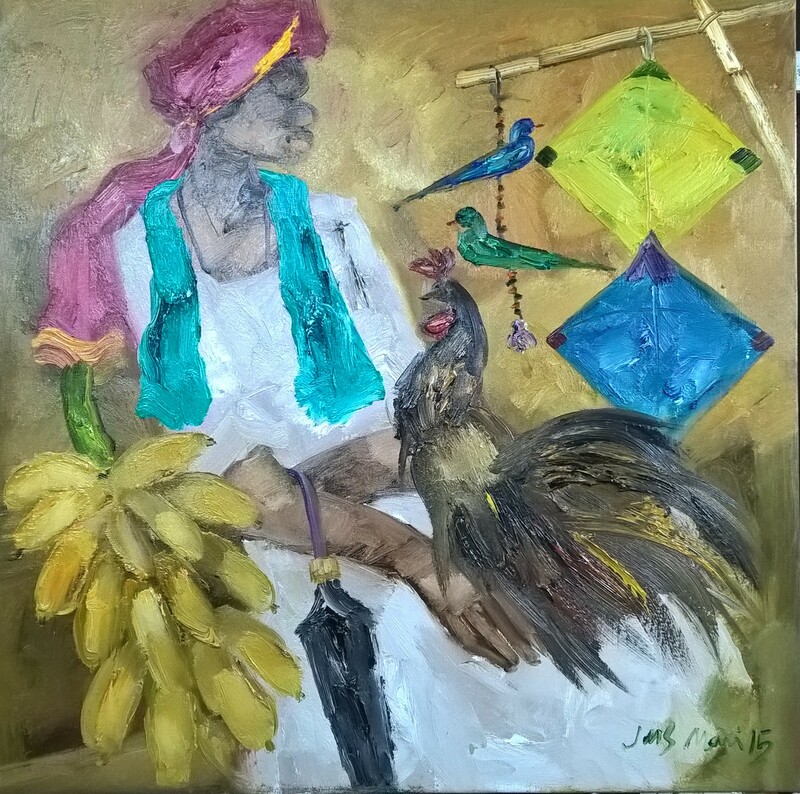 His art is an amalgamation of Indian culture with Occidental Western formalism. 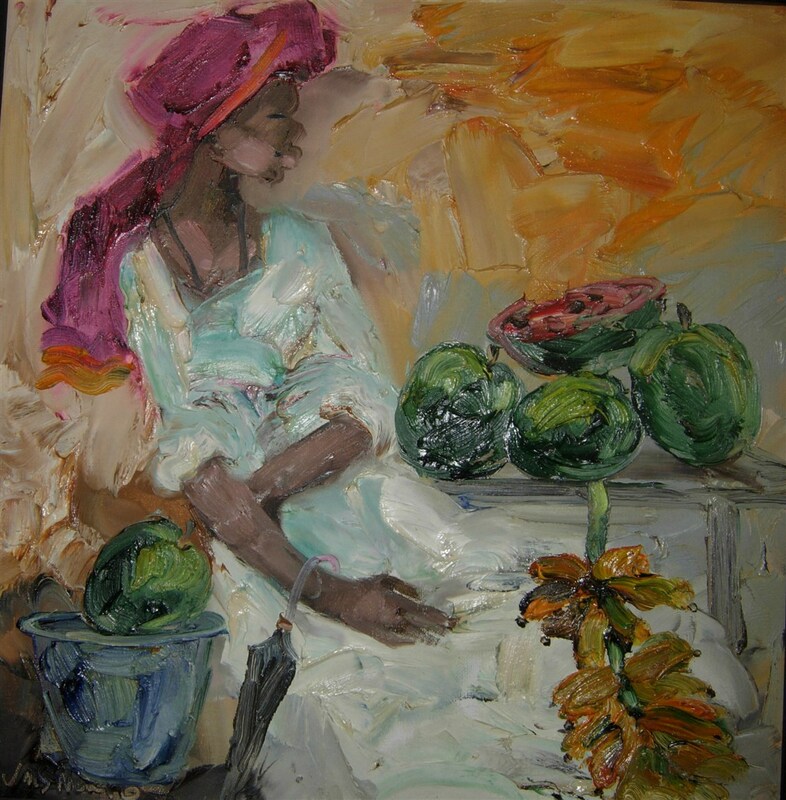 His figures are modeled in three-dimensional form, with bold brushwork, similar in style to those of the impressionists. 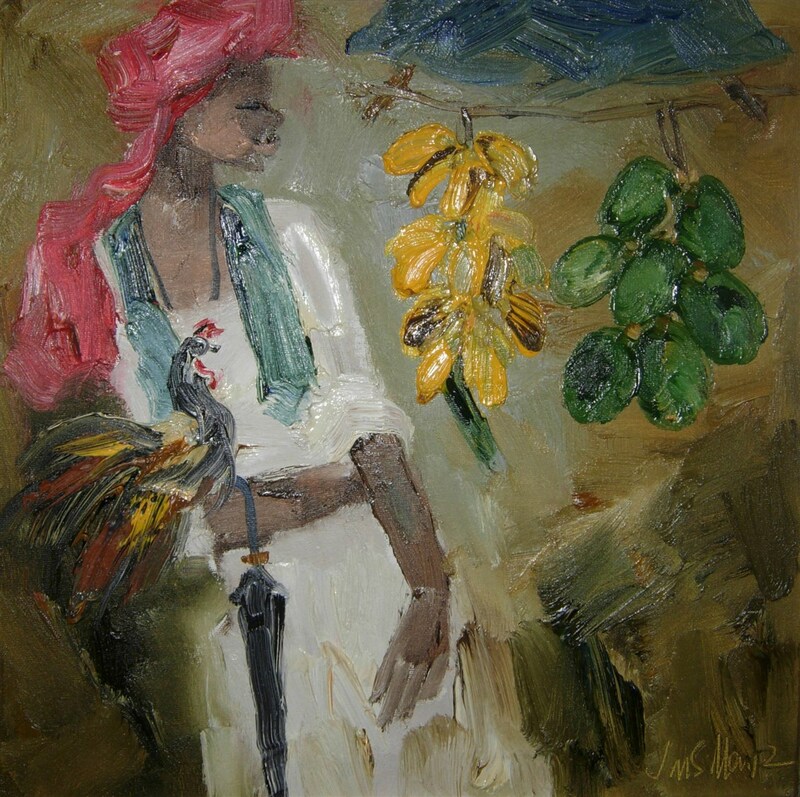 Mani chooses to depict his characters, the balloon seller, the women with a rooster, in a simple and uncluttered manner. They narrate an untold tale; much like the famous "Dancing Girl" of the ancient Mohenjodaran civilization of the Indus Valley; a tale that tells of the origins of an entire race. 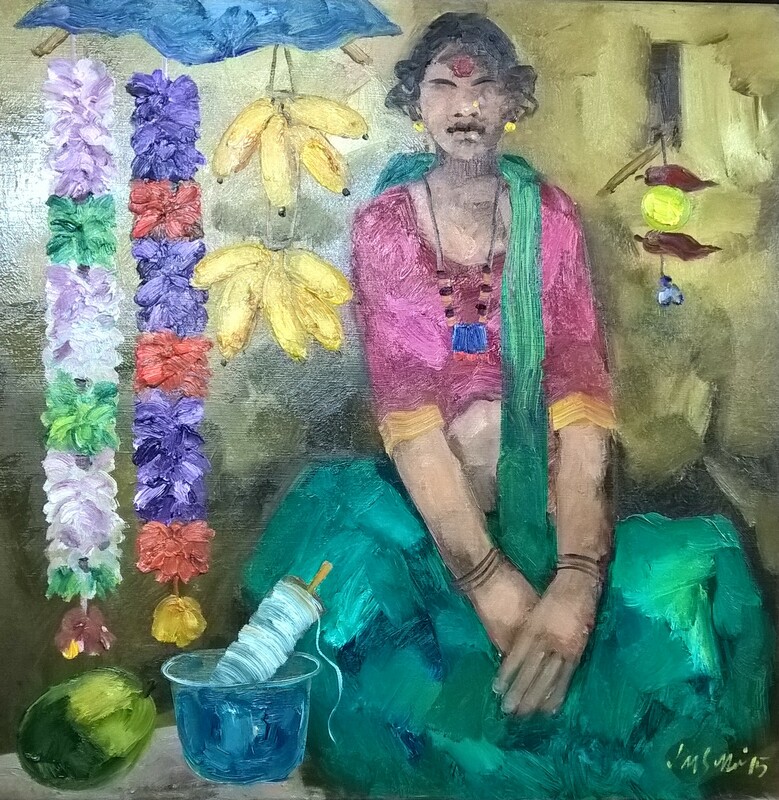 Though seemingly simple, Mani's images too, are representative of an entire civilization. 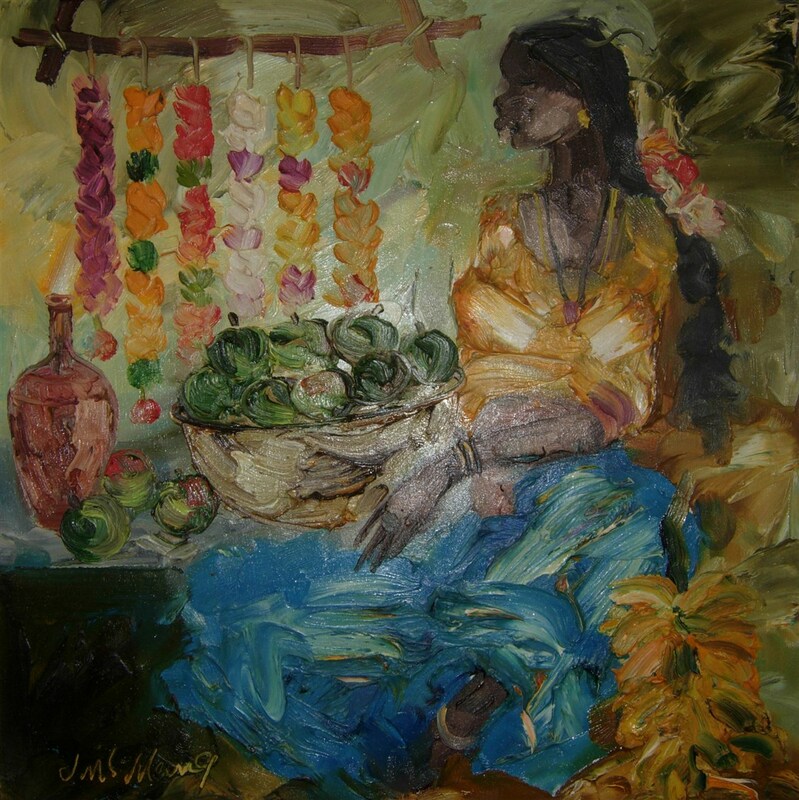 The pulsating colours in his paintings offset the dark skin of his characters, creating a sense of drama in his compositions. 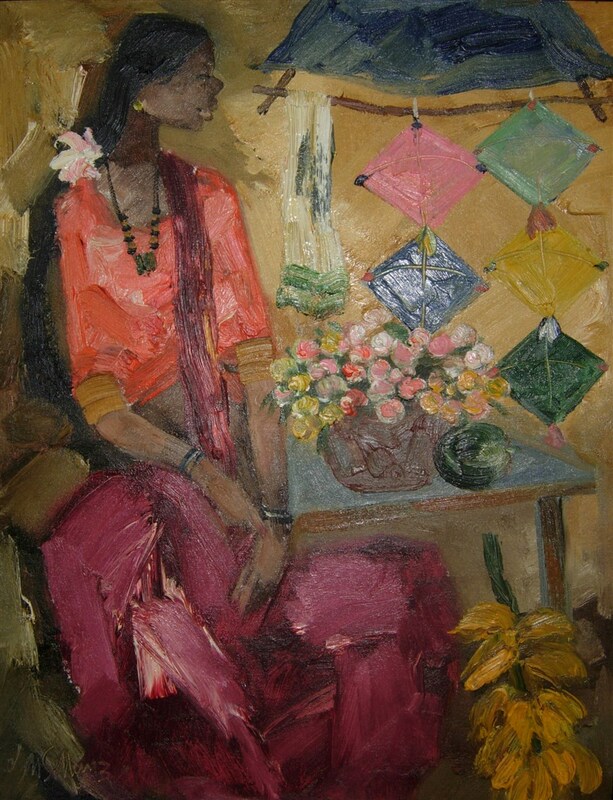 And it is his colours and compositions which are expressive, rather than the figures themselves. The figures appear to have been frozen within the canvas, and their beauty and grace is enhanced by the restricted use of gestures and expressions. J.M.S. 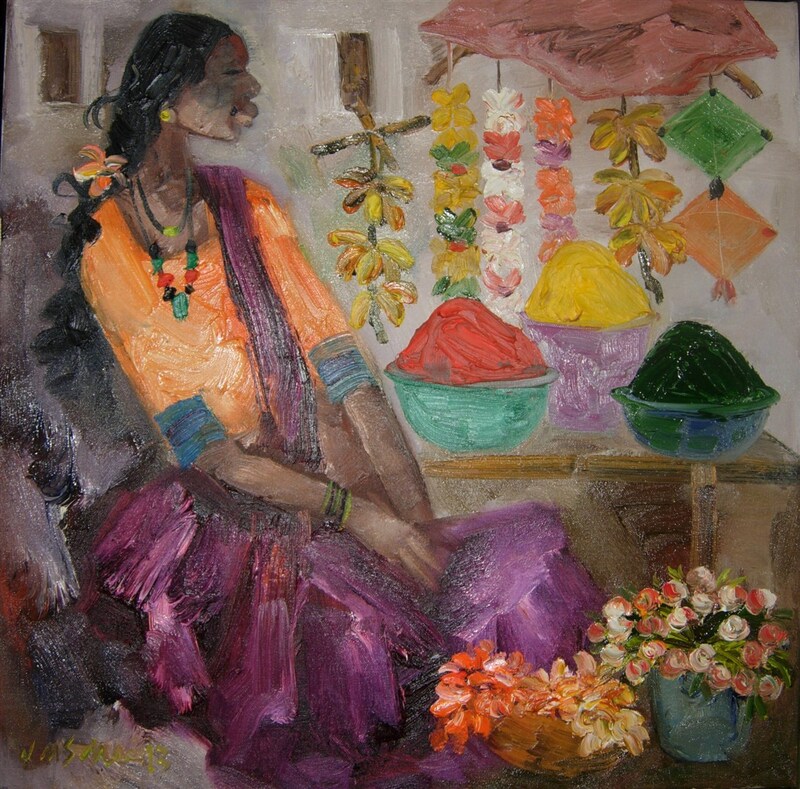 Mani has a diploma in Drawing and Painting from the Ken School of Art, Bangalore. 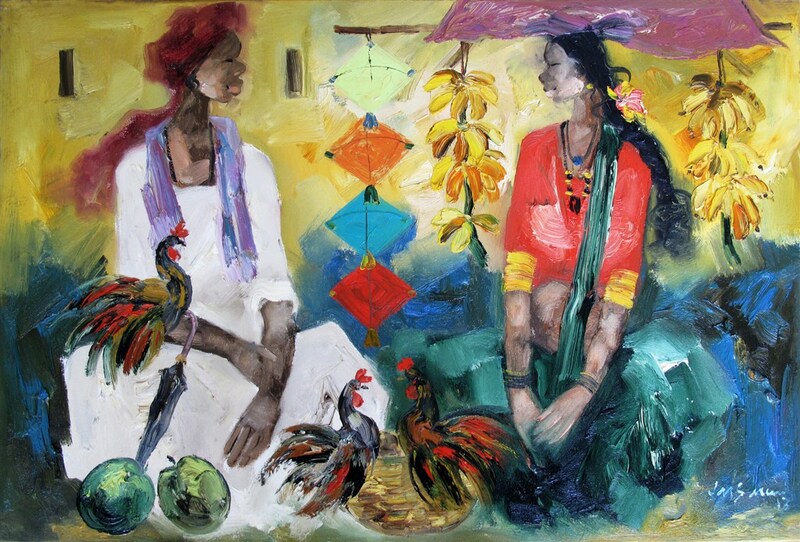 He won the Karnataka Lait Kala Akademi Award from 1981 to 1983. He has had 19 shows across India and in London. He has participated in 43 group shows, such as the SAARC Exhibition at the Chitra Kala Parishath, Bangalore and the Bharat Bhavan International Biennale of Prints in 1989. He currently lives and works in Bangalore.